Crab Facts - GOTTA LOVE DOWNE HORSESHOE CRABS & OTHER STUFF! GOTTA LOVE DOWNE HORSESHOE CRABS & OTHER STUFF! ​The Horseshoe Crabs are here! Horseshoe Crab Sightings Click are shown on the maps below. to see locations in each state or country where horseshoe crabs can be seen. Click on the logo above to go to ERDG's website! by holding the edge of their shell. Never use their tails! They can't pinch or bite you. We thank you for helping our ancient friends so they are able to return next year. New Spawning Season - New Logo! With the beginning of the new horseshoe crab spawning season, ERDG has given its Just flip 'em!™ logo a facelift. We hope our new design will more easily encourage this simple act of compassion for a species that will not survive our indifference. Just flip 'em!™ an ERDG program since 1998 is being practiced by coastal communities from Maine to the Yucatan Peninsula. Over the years this program has received broad support from individuals, coastal communities, nonprofit organizations, State and Federal agencies. This year, our new logo has been placed on durable aluminum signs, suitable for outdoor use. Seventy of these signs have been installed along the beachfronts of sixteen Delaware and New Jersey Bayshore Communities, ten of which are participants in ERDG's Backyard Stewardship™Community Horseshoe Crab Sanctuary program, which also began in 1998. These new signs can be seen and purchased on our website at the Company Store. If you live in an area where horseshoe crabs spawn and or have a friends or relatives who shares this habitat, please consider purchasing a sign for them, or DONATE to our organization, so that we can continue to provide our Just flip 'em!™ signs wherever needed. If you haven't heard the "Official" ERDG Just flip 'em!™ Song, written for us by the award winning Makin’ Music Rockin’ Rhythms in 2001, check it out. If you wish to sing along, you can download a pdf. of the lyrics. Please take a picture of you and your friends helping a stranded horseshoe crab and send it to us along with your name, date and where it was taken and we will post it on our Facebook page, which is seen and shared by other horseshoe crab conservationists around the world. Together we make a difference. Thank you for your continued support, without which, our mission to protect the world's four horseshoe crab species would be much more difficult. promise we made as part of the Education and Outreach working group objectives, outlined during the Third International Workshop on the Science and Conservation of Horseshoe Crabs held in Sasebo City, Nagasaki, Japan in 2015.
and organizations to solve problems, change behaviors and promote sound decisions in order to achieve sustainable horseshoe crab populations throughout the four species spawning range. However, in order for this section to function as intended, it needs your input. Please find your state and/or country in both the “Conservation Regulatory Agencies” and “Conservation NGO’s” subsections. ​If there are NGO groups or agencies we have missed, please let us know. It would be helpful if you could provide us with the group or agencies formal name and website address. However, any information you can provide would be most welcome. Thank you in advance for your help with this important project. We invite you to "Like" us on Facebook for a journey around the world, where our friends and partners share their horseshoe crab conservation efforts, both in the field and in the classroom. New 'living fossil' program at refuge highlights role of species The J.N. "Ding' Darling National Wildlife Refuge is offering a new program on horseshoe crabs. Held every Tuesday at 11 a.m. in the Visitor & Education Center, the 30- minute program covers why this "living fossil" is not a "true crab" and its importance to migrating shorebirds and the medical field. Free of charge and family friendly, the program kicked off in January and will run up through April 8. "The goal of the program is to express the importance of the horseshoe crab," volunteer Patty Wettstein, the presenter for the program, said. She explained that horseshoe crabs are present year-round at the refuge and are especially visible during the new moons and full moons, which are times when the invertebrate species spawns. As arachnids, they are more closely related to spiders and scorpions than crabs. Using a PowerPoint presentation and educational tools, including a life-like course one weekend at a wetlands institute in New Jersey. They brought back what they learned to jumpstart the program. "We wanted to bring it back because we knew horseshoe crabs were here," she said. One of the educational tools for the program that the refuge staff is excited to utilize is the model, developed by the Ecological Research & Development Group in Delaware. The world's first museum-grade model of a female horseshoe crab, it shows the species' exterior surfaces complete in detail. The top of the model separates from the bottom of it to reveal the internal organs - colored for easier identification - egg distribution and circulatory system, providing a view never before available. "It greatly enhances the program," Wettstein said. "It has added so much to it." The refuge was able to acquire the tool through a donation by a donor. On Jan. 30, Sharon and Elwood Leonard sat in on the horseshoe crab program. Visiting from Wisconsin, the couple explained that they had seen the species while touring the refuge. "We've seen a lot of horseshoe crabs," she said. "We thought it would be fun to learn a little bit more," Sharon Leonard added. Elwood Leonard agreed. "We've seen these things in the water," he said. "It'd be interesting to know a little more about them." His wife was intrigued by the species' role in the medical field. "The reason they take the blood," she said. Asked about the response to the program, Wettstein said visitors are excited. "A lot of visitors don't know about the medical aspect," she said. For more information, call 239-472-1100 or visit www.fws.gov/refuge/jn_ding_darling. The J.N. "Ding' Darling National Wildlife Refuge is at 1 Wildlife Drive, Sanibel. Delaware: The Delaware Shorebird Project has premiered “Feast on the Beach: The Delaware Bay Horseshoe Crab Shorebird Connection,” a film produced to raise awareness and understanding about the ecological connection between horseshoe crabs and shorebirds migrating through the Delaware Bay area, as well as the researchers who study them. ERDG’s Backyard Stewardship™ and Just flip ’em!™ programs are also featured. download the pdf. ERDG, who is dedicated to the conservation of the world’s four horseshoe crab species, launches a completely rebuilt “Conservation” section on its award winning website www.horseshoecrab.org, but it will not realize full potential without your input. 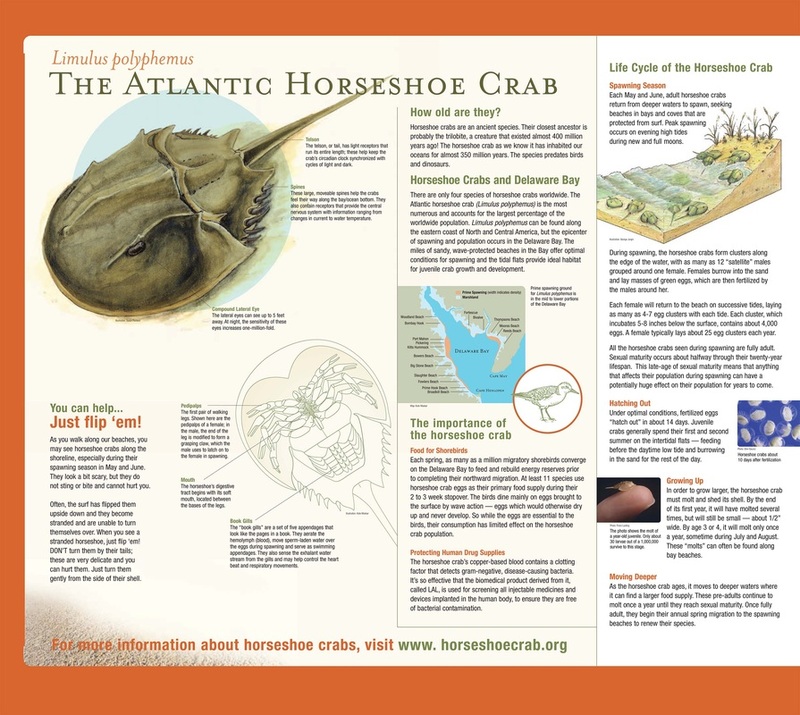 This new “Conservation” section is designed to foster communication between governmental organizations (GO's), non-governmental organizations (NGO's) and the general public, by providing information on who is doing what and where, as it pertains to horseshoe crab conservation. However, as you will notice, many areas are data deficient. Please help us complete this valuable tool by sending us erdg@horseshoecrab.org information about the GO's and NGO's in your country. Specifically, we seek the formal name of the organization, link to its website, what they do as it pertains to horseshoe crab conservation and the geographic area they cover. You will notice we have also added a “Conservation Toolbox" subsection, which is designed to provide the NGO with mission relevant information around three key headings. Please feel free to send us articles that complement these headings. With your help, we can bridge the information divide that often hinders our ability to engage the broadest coalition behind the conservation of this remarkable mariner. Rhode Island: Rhode Island’s horseshoe crab population is not plummeting, it is not increasing, either, so the state is trying to manage the stock to ensure its long term survival, while considering the needs of commercial harvesters. Following a Dec. 5 hearing that included submissions from the Rhode Island Marine Fisheries Council, scientists, commercial harvesters and Save the Bay, the Rhode Island Department of Environmental Management is expected to approve new amendments to regulations governing the horseshoe crab harvest. Horseshoe Crabs in the Delaware Bay. " A Shot Gun Approach"
Delaware Bay has more spawning Horseshoe Crabs each Spring than anywhere else in the world. according to the Annual Horseshoe Crab Spawning Survey conducted on most Delaware Bayshore beaches annually. In fact, last year, according to the survey, Fortescue had more crabs than any other New Jersey beach. This short video segment, taken from a PBS documentary produced by Michael Oates (Fortescue property owner, former resident), provides an overview of what takes place on Delaware Bay beaches each Spring. ​How to Become Better Stewards of Our Wonderful Environment! HSC Beach Walks Everyone Learns! Learning About Horseshoe Crab Anatomy.